VIGYAN PRASAR, Department of Science and Technology, Government of India, in collaboration with Public Outreach and Education Committee (POEC) of the Astronomical Society of India (ASI) organized three regional workshops to sensitize various educational institutions on an important mass campaign. Every place on the Earth that is between the Tropics of Cancer and Capricorn will have two days in a year where the Sun will be directly overhead. For India this day happens during Uttarayan, that is, from the time period from April to September. On this Zero-Shadow Day (ZSD), a vertical pole will cast no shadow, and will cast a longer and longer shadow as we move away from this day. This apparently simple phenomenon is an excellent experiment that all the students can do for themselves. In this process, they can learn about simple trigonometry, motion of Sun and Earth, the cause of seasons, and optics. The advantage is that measuring shadows over a few days can be done during school hours around local noon, involves almost no cost and importantly doable. The southern regional workshop was organized at Puducherry by Centre for Ecology & Rural Development, Pondicherry Science Forum, on March 10 and 11, 2018, in Puducherry for teachers, technical professionals and science communicators from the southern states. 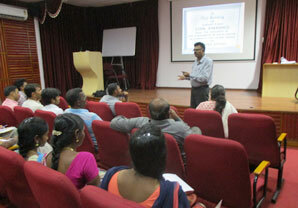 The venue of the programme was the APJ Abdul Kalam Science Centre & Planetarium, Lawspet, Puducherry. 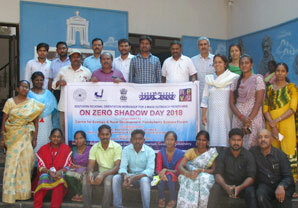 This is to train them about the Zero Shadow Day so that they can in turn train teachers in their local areas to conduct these ZSD experiments in their schools. 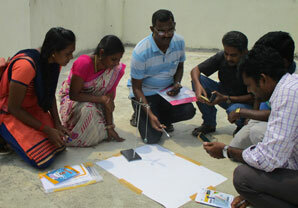 Three SARVAM teachers participated in the workshop. It will ensure that all the children who attend the Children’s Corner over the weekends can learn about this wonderful scientific experiment.